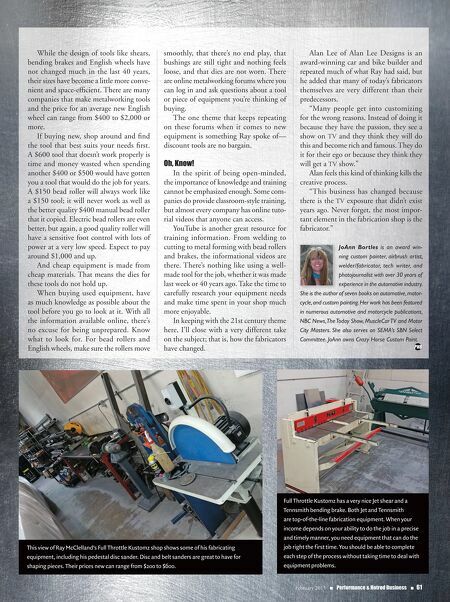 February 2015 n Performance & Hotrod Business n 61 While the design of tools like shears, bending brakes and English wheels have not changed much in the last 40 years, their sizes have become a little more conve- nient and space-efficient. There are many companies that make metalworking tools and the price for an average new English wheel can range from $400 to $2,000 or more. If buying new, shop around and find the tool that best suits your needs first. A $600 tool that doesn't work properly is time and money wasted when spending another $400 or $500 would have gotten you a tool that would do the job for years. A $150 bead roller will always work like a $150 tool; it will never work as well as the better quality $400 manual bead roller that it copied. Electric bead rollers are even better, but again, a good quality roller will have a sensitive foot control with lots of power at a very low speed. Expect to pay around $1,000 and up. And cheap equipment is made from cheap materials. That means the dies for these tools do not hold up. When buying used equipment, have as much knowledge as possible about the tool before you go to look at it. With all the information available online, there's no excuse for being unprepared. Know what to look for. For bead rollers and English wheels, make sure the rollers move smoothly, that there's no end play, that bushings are still tight and nothing feels loose, and that dies are not worn. There are online metalworking forums where you can log in and ask questions about a tool or piece of equipment you're thinking of buying. The one theme that keeps repeating on these forums when it comes to new equipment is something Ray spoke of— discount tools are no bargain. Oh, Know! In the spirit of being open-minded, the importance of knowledge and training cannot be emphasized enough. Some com- panies do provide classroom-style training, but almost every company has online tuto- rial videos that anyone can access. YouTube is another great resource for training information. From welding to cutting to metal forming with bead rollers and brakes, the informational videos are there. There's nothing like using a well- made tool for the job, whether it was made last week or 40 years ago. Take the time to carefully research your equipment needs and make time spent in your shop much more enjoyable. In keeping with the 21st century theme here, I'll close with a very different take on the subject; that is, how the fabricators have changed. 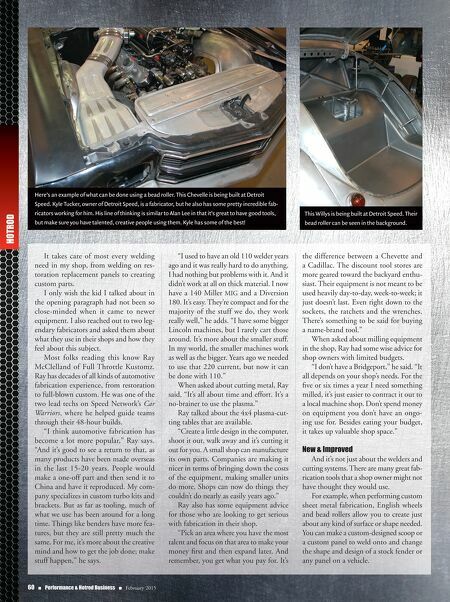 Alan Lee of Alan Lee Designs is an award-winning car and bike builder and repeated much of what Ray had said, but he added that many of today's fabricators themselves are very different than their predecessors. "Many people get into customizing for the wrong reasons. Instead of doing it because they have the passion, they see a show on TV and they think they will do this and become rich and famous. They do it for their ego or because they think they will get a TV show." Alan feels this kind of thinking kills the creative process. "This business has changed because there is the TV exposure that didn't exist years ago. Never forget, the most impor- tant element in the fabrication shop is the fabricator." JoAnn Bortles is an award win- ning custom painter, airbrush artist, welder/fabricator, tech writer, and photojournalist with over 30 years of experience in the automotive industry. She is the author of seven books on automotive, motor- cycle, and custom painting. Her work has been featured in numerous automotive and motorcycle publications, NBC News, The Today Show, MuscleCar TV and Motor City Masters. She also serves on SEMA's SBN Select Committee. JoAnn owns Crazy Horse Custom Paint. This view of Ray McClelland's Full Throttle Kustomz shop shows some of his fabricating equipment, including his pedestal disc sander. Disc and belt sanders are great to have for shaping pieces. Their prices new can range from $200 to $600. Full Throttle Kustomz has a very nice Jet shear and a Tennsmith bending brake. Both Jet and Tennsmith are top-of-the-line fabrication equipment. When your income depends on your ability to do the job in a precise and timely manner, you need equipment that can do the job right the first time. You should be able to complete each step of the process without taking time to deal with equipment problems.